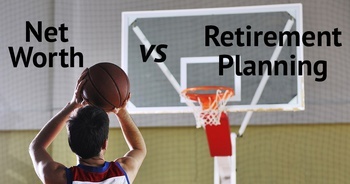 Your retirement plan is an important part of your overall financial picture… just as your net worth is. There is some overlap between the two, but also some very important differences. You cannot rely on a net worth snapshot to tell you if your retirement savings are on track… and there are many important aspects of a retirement plan that have no place in your calculation of net worth. Dec. 7, 2018, 6:08 a.m. When you’re creating a plan for retirement, you need to calculate your expenses and income in the golden years. Ideally the two are balanced such that you outlive your money or you leave some target amount to your beneficiaries. What it comes down to is how much needs to be withdrawn each month from savings and investment accounts to cover expenses. If you are really into analyzing the numbers try our Income Spending Simulator. After you input your expected income, assets, and expenses it gives a complete picture of annual cash flow and net worth, plus it lets you run comparisons to see the impact of different decisions. Now we can use her monthly withdrawal amount to gauge what kind of impact that will have on her over the next 30 years. This done by computing her withdrawal rate, which comes out to 4.4% - $2,200 * 12 = $26,400. $26,400 / $600,000 = 4.4%. A rate of 4.4% isn’t ideal, but not too bad either. If you are new to the idea of a withdrawal rate and why it is important see our post on How Much Is Enough For Retirement. According to our nest egg retirement calculator which does historical backtesting similar to the Trinity study, if Betty sticks to her current spending plan and only increases it with inflation she will outlive her money 95% of the time (over 30 years). A withdrawal rate below 4% would be better, and at this point for Betty it really comes down to luck and macroeconomic forces. Betty could cut her spending a little, or pickup a part time job, or not worry about it since she’d be 97 in 30 years and her odds of making it that far are about 10%. Plus she has the house as a sizable asset to fall back on which isn’t included in any of this since it isn’t something she can sell a small part of to pay for food. Still she could downsize if she needed to and tap into some of the value. When you calculate net worth, you’re looking at a snapshot of your assets minus your debts. If you own a home worth $500,000 and don’t have a mortgage, that home is an asset in your net worth calculation—and probably a big part of your overall net worth. The market value of your home, however, doesn’t necessarily reflect what it costs for you to live in it. Assuming that’s what you intend to do throughout your retirement, the value of your home—and as a result, your total net worth—is fairly irrelevant to your retirement planning. On the flip side, knowing how much you can expect to receive from social security and/or pension plans is an essential part of retirement planning. However, social security is an expected source of income but has no immediate cash-in value… which means it has no place in your net worth calculation at all. Pension plans are more complicated. Whether or not they should be included in net worth calculations depends on the fine-print of each individual plan. If the plan could be cashed out early, or has a specific value that your heirs would inherit if you die before using it, you should include that value in your net worth calculation. When it comes to retirement planning, though, the most important thing to know about your pension plan is how much income you can expect to get from it on a monthly basis throughout your retirement. When it comes to the example about Betty above - her house is an asset she could tap into later in life if she had to. Or she could leave that to her kids. The house is not really included in her retirement plan, except as an expense in terms of insurance, taxes, and maintenance. Now if she sold the house today and moved into a $1,200 55+ community, she’d have $300,000 of extra money, or $900,000 total investable net worth to use against her withdrawal ratio, making taking it from 4.4% to 2.9%. That means she could spend more each month, or shift her allocation to less risky assets (accepting a lower overall return but reducing volatility). The biggest overlap in the net worth and retirement picture is in individual retirement accounts, like 401(k)s. Individual retirement accounts are certainly an asset to count in your net worth picture; they are also a big part of many people’s retirement plans. There’s also overlap when it comes to debt. It’s generally a good idea to pay down debt as much as possible before retirement; especially since most retirees have a lower income than they did during their working years. Less (or zero) debt will always mean a higher net worth, and paying down debt is a smart way to plan for retirement. The bottom line is that calculating your net worth can give you some useful information about how prepared you are for retirement; but it’s far from the whole picture. When thinking about your retirement planning, you need to focus on your income and expenses in retirement—and looking at your net worth will give you a very incomplete picture. Income Spending Simulator - knock yourself out with a very detailed plan and play with comparisons. Retirement Nest Egg Simulator - tells the longevity of a nest egg based on withdrawal amount and a certain allocation of stocks/bonds. Nest Egg Savings and Investment Simulator - for saving up towards retirement based on regular contributions and a certain allocation of stocks/bonds. Thoughts on a precise definition of net worth.